The ultimate commuting folding bike, with practically zero drivetrain maintenance required: The Bike Friday Tikit, equipped with a Shimano Alfine 11 internal hub, and a Gates Carbon Belt Drive system! As I have previously reviewed, the Shimano Alfine 11 internal hub is an impressive piece of engineering excellence. It befuddles most people as to how an internal hub works, including me. With 11 well spaced gears, there are more gears than you can use, with a very big gear range of over 400%. When paired with a disc brake, it offers excellent braking performance, and is quite weatherproof as the brake pad does not disintegrate in wet weather like those used on road caliper brakes or V brakes. 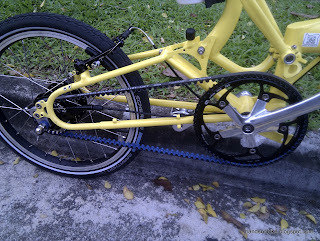 To make it even better, the bicycle chain can be eliminated with the use of the Gates Carbon Belt Drive. It uses a carbon-reinforced Kevlar belt that drives the bike. The beauty of a belt drive is that it rides extremely smoothly, has a longer lifespan than a standard chain, is lighter than a chain+gear system, is very clean and does not require maintenance at all. When you combine an internal hub gear system and a belt drive, you get a drivetrain combination for commuting that is hard to beat! No gears or chain to clean or lubricate, no cleaning required, just get on the bike and ride! How to make this system even better? 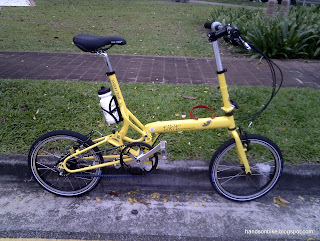 Install the system on a Bike Friday Tikit, and you have made the entire system foldable and portable. Simply brillant! I had a privilege of trying out this particular bike at MyBikeShop, and it was quite a revolutionary experience. No drivetrain sound at all, just smooth pedaling and quick gear changes. Drool over the pictures! 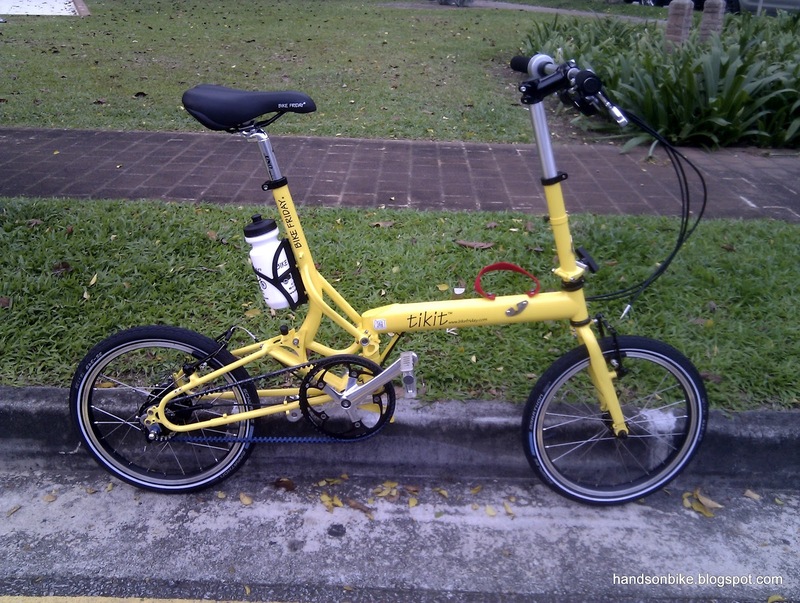 A very new bike, in striking yellow colour! Clean lines with no RD. Belt drive system, once again very clean lines! A closer look at the belt used for the drivetrain. Also, see the 2 bolts that are located on the upper arm of the rear triangle. This is required to allow the frame to split, so as to install the one-piece belt. Close look at the belt, the internal hub and the rear sprocket. 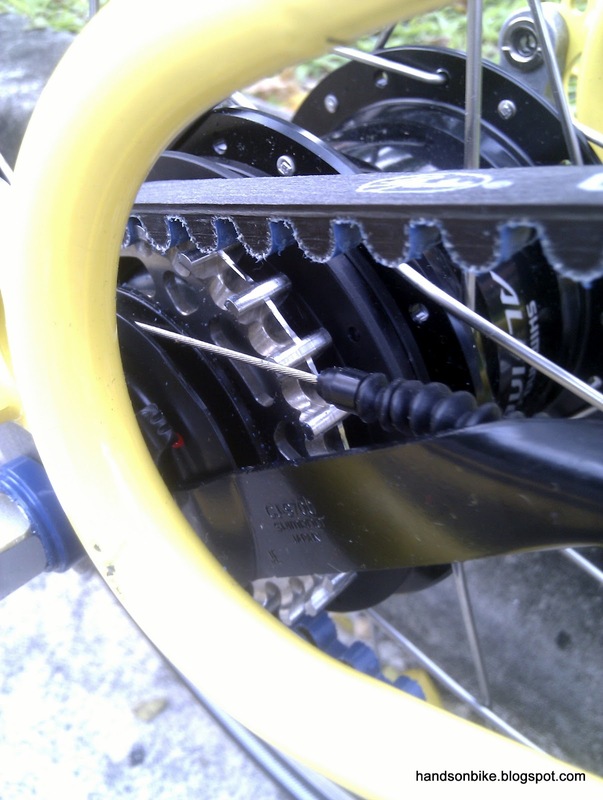 For a belt drive system, the sprocket and chainring are called pulleys. The front pulley of the belt drive. Mounts on the crank using a standard 130mm BCD dimension. I only tried the bike for a while, so I cannot comment too much on how the bike will perform on longer rides. However, the difference in ride quality is evident the moment you pedal off. 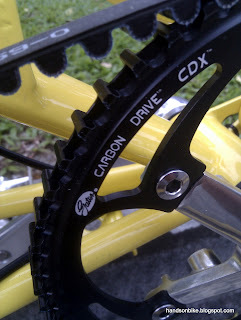 The smoothness of the drivetrain is something which you will never feel on a bike that uses a conventional metal chain. 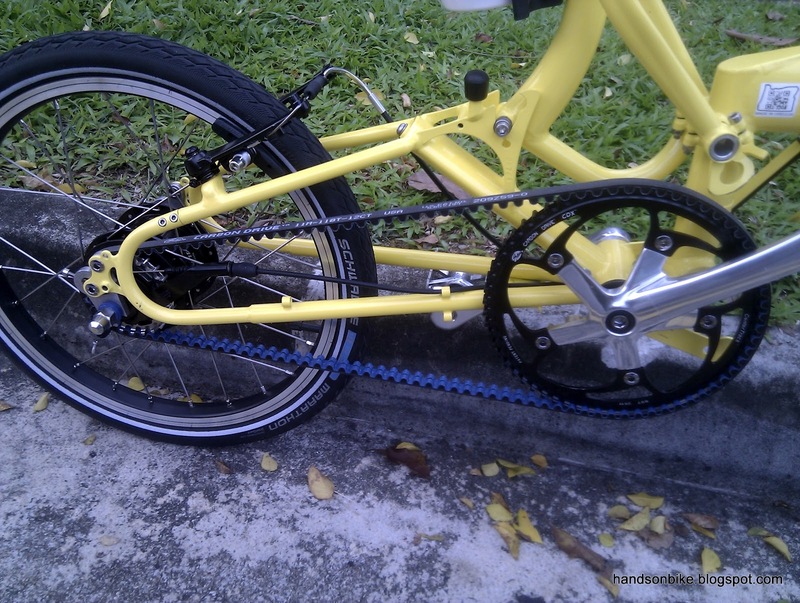 One unfortunate downside to this bike is the brake system that is used. 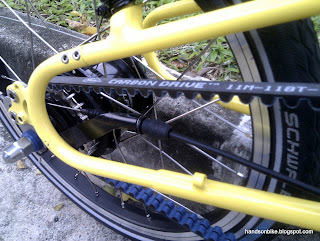 For me, I think that it is a pity that V brakes are used instead of disc brakes. The Alfine 11 hub can accept disc rotors, and it should be used as it will make the entire drivetrain even more weatherproof. This is one area which I think this bike's specifications can be improved. Not sure if using disc brakes will affect the folding. Other than this little disappointment, the Bike Friday Tikit Carbon Drive Alfine 11 is a very interesting bike that looks good, rides well, folds well and requires very little maintenance! I was in the market for a folding bike last year, and I looked at Bike Friday, but I ultimately went with a Montague Boston 8. Internal hub, chain drive, but the full-size wheels make the ride hard to beat. Hi, sorry some newbie questions.. BF chain used to drop whenever folded. Does the belt drive or the internal gear hub solve this problem? Can a bull horn with bar end brakes be used with the gates belt n alfine gears? Not sure why you say the Bike Friday chain will drop when folded? The whole rear triangle is one piece, and so the chain does not become slack when folded, so not likely to drop. For Alfine internal hub, you will need the Alfine shifter to shift the gears. As long as the shifter can be mounted on the handlebar, it is OK. As for braking, it depends on the type of braking system on the bike. With bar end brakes, you can go for V brakes or mechanical disc brakes. Which brake system you can use depends on the frame.